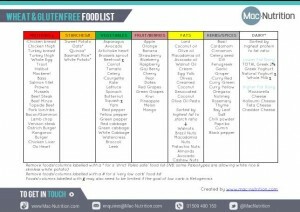 This is a wheat and gluten free food list that also contains information on how to adjust the foods shown to allow for a paleo friendly food list as well as suitable foods to choose for a low carb and even ketogenic diet. Please note, following paleo, low carb or ketogenic diets are by no means the healthiest way to eat. This resource has been put together to simply help any individuals wishing to follow this way of eating, Even if you don't follow any 'diet' in particular, eating a variety of the foods listed in this resource will constitue a healthy diet. If you have a specific goal and would like to see one of our nutritionists to find out the best foods to help with your goal, please download a pre-consultation form from our SERVICES pages. Alternatively, drop us an email at enquiries@mac-nutrition.com.